Sure, an industrial enclosure is great for keeping your equipment behind a locked door...but there is so much more to it! Your equipment is special, and it deserves protection. It could be waterworks equipment like a sprinkler valve, backflow preventer, water meter, or a booster pump. Or maybe you have water storage tanks, a glycol pump system, or a PRV station. You might need a cover for an air compressor or generator, a backup battery system or railroad switch. An enclosure can provide protection for practically any industrial equipment. This is because an aluminum enclosure provides a huge variety of protections and uses. Click each heading below to see an example. 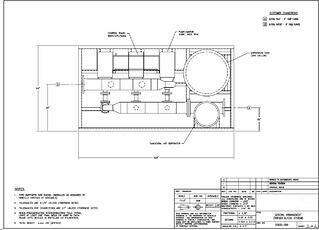 Our engineers worked closely with the customer to design an industrial enclosure for their glycol pump systems. The first box would cover a four pump system with a tangential air separator tank and bladder tank. The second would protect a three pump glycol system with a tangential air separator tank and an expansion tank. Both are to be skid mounted. Read more about glycol system enclosures here. This enclosure was for a quench system at a glass plant. 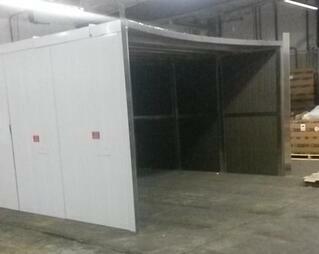 This custom enclosure is 36” wide x 108” long x 72” tall. The design includes both removeable access panels for routine maintenance and removable roof for equipment replacement. The user needs penetrations for system supply and return lines, but they will be done in the field by the end user. This custom enclosure will also include an exhaust fan and louver to provide ventilation for the pump during summer conditions and a slab mounted heater that will maintain a temperature of 40 degrees for the winter. The customer also requested a window located in specific location to allow for quick visual inspection of control panel and gauges. Read about quench system enclosures here. 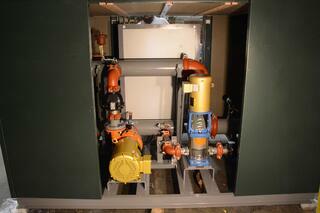 This enclosure was installed on a packaged booster pump system skid. The enclosure includes a thermostatically controlled exhaust fan and an intake louver that opens and closes with the operation of the exhaust fan. Notice the enclosure has a removable access panel at the location of the control panel for the pump system. The enclosure also has a removable access panel on the opposite side of the enclosure for routine maintenance of the pump system. Notice the penetration in the enclosure. the customer field modified this panel to meet their exact need. Climate control and sound dampening are the two most important factors for this enclosure choice. Other options add icing to this cake. It's nice to have removable panels for access and maintenance. These enclosures are big, you may even liken them to the size of small garages. Workers sometimes need to be able to access them from multiple sides. Including removable or hinged doors and panels is helpful. Manufacturers with a modular design can more easily incorporate these types of panels into their enclosures. 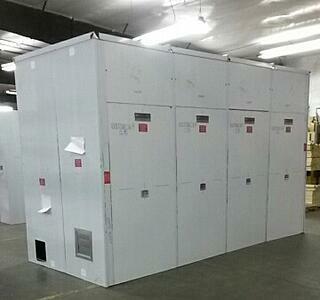 This customer says, "A modular enclosure allows for flexibility, better shipping, and job site flexibility." Imagine having to pay for the shipping of a small garage. Read about air conditioning pump enclosures here. It is key that a custom enclosure is able to fit around your equipment. When the equipment is a 200,000 gallon water tank, that means it has to pretty big. This customer requested two enclosures to cover a fire water tank. One needed to be 169" wide by 168" long by 96" tall, and the other was a slightly more modest 163" wide by 155" long by 96" tall. In addition to their large size, these two enclosures needed to be mounted to the radius of the 200,000 gallon tank. The customer also requested removable access panels for routine maintenance and component replacement. 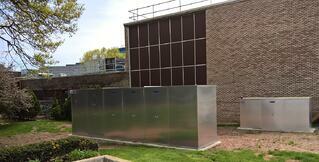 Read about fire water storage tank enclosures here. Safe-T-Cover offers more than 50 standard sized backflow enclosures, but some valves have strainers, fire department connections, or other considerations that make them non-standard. 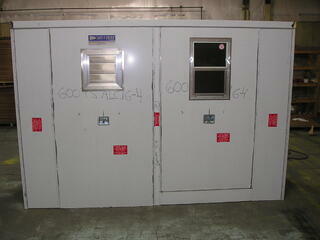 These two enclosures are for a 4"RPZ and a 10" DCDA with associated meter for a fire service. They also needed to be lockable and they include a power and temperature failure alarm. Sometimes backflow valves need to include the meter inside the enclosure and some even need to install multiple backflow valves in one enclosure. Click here to read more about this backflow preventer enclosure.